Church bells rang out for the Yorkshire Festival and Le Tour de France. Ringing and press coverage throughout the Yorkshire Festival and the build up to Le Tour are listed in chronological order below. 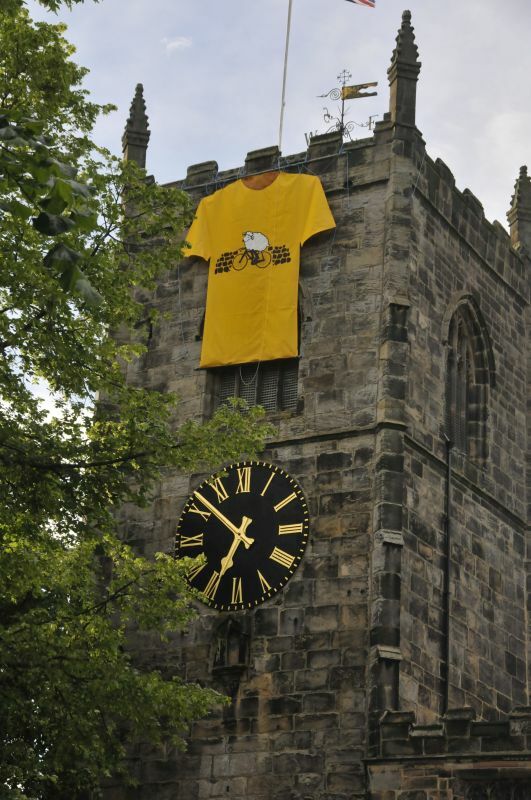 First, to get you in the mood, here is a 5m square yellow jersey on Skipton Church tower. This grabbed the attention of the helicopter TV cameras. 10 May 2013 – Rod proposes bellringing as a festival event at the Tour de France roadshow in Sheffield. Subsequently interviewed about it by BBC Radio Sheffield for that day’s drivetime show. Summer and Autumn 2013 – Development of Tower Briefings to help share news about Le Tour and about how ringing could form part of Yorkshire’s welcome. Also working on a submission about churches and bells for the Tour “Yellow Book”. Wednesday 29 January – Derek and Ronalda Johnstone took the Wombel training bell to the media launch of the Yorkshire Festival Programme at the Trinity Centre Leeds, being interviewed for BBC Radio and reinforcing YACR credentials at a pivotal point in engagement with the Tour. Friday 21 March – after a week in the saddle, the BBC Tandem team of Harry Gration and Amy Garcia completed the two stages of Yorkshire’s Grand Depart. Well done to Oxenhope and Haworth Ringers who rang for Harry and Amy on their ride. At the finish line, Mr Bells & Bikes got in frame for the tv cameras with that polka dot shirt! Wednesday 26 March – Songs of Praise TV cameras came to Otley to meet the new band of learners training specially to be ready to ring for Le Tour. Presenter, Connie Fisher, received a lesson from Otley Captain Meg Morton and interviewed Rod Ismay about the whole venture of ringing for Le Tour. The Wharfedale Observer published the story of filming with Songs of Praise at Otley. And the Ilkley Gazette published the Songs of Praise story too. Thursday 27 March – Rod interviewed live on BBC Radio York and BBC Radio Leeds at the #Y14 launch event for the Yorkshire Festival. Ripon Cathedral then played host to the annual Tour 100 Day Dinner that evening and the Ripon band rang a quarter peal before the dinner. Knaresborough rang 60 on thirds to celebrate the launch and Perth bells rang out on the opposite side of the world as a tribute from ANZAB ringers to Yorkshire. Thursday 27 March – the Cathedral of Sheffield St Marie’s rang a quarter peal on 8 to celebrate the first anniversary of the installation of new bells at Notre Dame Paris, and to mark the launch of the Yorkshire Festival. Thursday 3 April – bellringing featured live on the BBC Radio Leeds Breakfast Show. Liz Green interviewed Matthew Sorell, President of the Australian & New Zealand Association of Bellringers, live from Adelaide. Matthew explained ANZAB’s part in supporting Le Tour and the Yorkshire Festival. Adelaide features on the Tour Down Under (Pro Cycling World Tour Races). In 2012, Bradley Wiggins rang a 23 tonne bell at the Olympic Opening Ceremony. On 3 April 2014, Matthew rang a 2kg bell live (not just any bell, but the Trophy Bell won by Adelaide in the International Bellringing Competition held 25 years ago). Click the link below. Liz Green’s show is 3 hours. Bellringing features at 01:53:40 on the timer. Running for 5 minutes. BBC Radio Leeds – Tour de France – 100 Days, 100 Stories – 92.4 FM, 95.3 FM & Digital. Cancelled Monday 21 April – Deferred to Autumn. Apologies. Askrigg tower open day. A beautiful church in a beautiful part of the Dales. Saturday 17 May – Harrogate St Wilfrid’s. Bellringing demonstration and “have a go” session 1 – 3 pm as part of Church Centenary Fayre 11 – 3. Several groups of visitors were hosted in the tower and there are possibilities of new recruits from the open day. A good event. Friday 30 May – Knaresborough. Ringing to celebrate the Feast Day of St Joan of Arc, Protector of France. Saturday 7 June – York St Wilfrids tower open day. Saturday 14 June – Dewsbury Minster Fest. A wide ranging event all day (9.30 – 5.00). Have a go at handbell ringing, church bell ringing, ukelele, drama, drumming, stories, poetry, streetbike and more. This great itinerary is now a formal Fringe Event as part of the Yorkshire Festival. Filming the ringing and bells. Interview with Rod regarding that weeks news that bellringing would be a formal part of the Tour de France Opening Ceremony. Sunday 22 June – Ringing for another cycle event! Rung a quarter peal of Plain Bob Minor at Tideswell to celebrate the Eroica Britannia cycle event which was hosted in Bakewell that weekend and involved rides around the peak district. Rod interviewed about bellringing for the Tour and the Opening Ceremony. Featured 20 seconds of well struck ringing from Penistone and a little bit of handbells. Saturday 28 June – Grinton Tower Open Day (10 – 4) with displays, demonstrations and refreshments. Sunday 29 June – BBC Radio 4 Bells on Sunday featuring Chapel Allerton bells. BBC Radio 4’s Bells on Sunday is broadcast every Sunday at 05:43 and repeated on Monday at 00:45. Sunday 29 June – Songs of Praise Tour de France edition. Featuring Otley bellringers. 1725. Thursday 3 July – “The Big Ring”. Over 70 towers ring across Yorkshire at 8.20pm for the Opening Ceremony. Cawthorne, Masham and Chapel Allerton pre-recorded along with Yorkshire Tykes band at Ossett. The films of these towers were included in Gary Verity’s welcome speech to the Tour riders, world media and over 10,000 fans in the Leeds FD Arena. BBC Look North cameras film up Leeds Minster on the night too. Friday 4 July – special welcome rings across Yorkshire. Saturday 5 and Sunday 6 July – ringing along the race route. Saturday 5 July – ringing for Stage 1 of Le Tour (from Leeds to Harrogate via the Dales). The Grand Depart. Ringing at many churches along the route. Leeds St Annes, Leeds Minster, Chapel Allerton, Otley, Ilkley, Addingham, Rylstone, Grinton, East Witton, Masham, West Tanfield, Ripon Cathedral, Harrogate St Peters. Chapel Allerton – Open tower (come and find out about ringing) from 10am. Addingham. Ringing 9.15 to 9.45 on both race days to welcome the caravan. Welcome, from Ilkley & Addingham ringers! St Anne’s Cathedral Leeds – peal ringing. St Anne’s is the tower closest to the formal start point of the 2014 Tour de France. Peals also planned at Leeds Minster and Ripon Cathedral. Sunday 6 July – ringing for Stage 2 of Le Tour (from York to Sheffield via Skipton). Starting with ringing and public open towers in York in the morning. Public open day (have a go) from 12-5pm at St Martins, Coney Street York. Sat / Sun 5/6 July – global bellringing for Le Tour. Perth bellringers, Australia, travel to York (Australia) to ring for Le Tour in Yorkshire. Find out more in Matthew Sorell’s BBC Radio Leeds interview in the clip below (3 April).